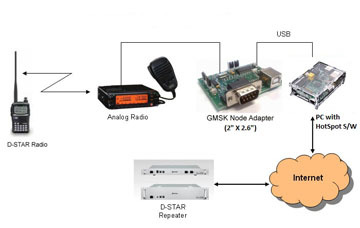 D-Star* (Digital Smart Technologies for Amateur Radio) is an open specification for amateur radio transmission of digital voice and data. It was developed under the leadership of the Japan Amateur Radio League (JARL). ICOM, as one of the manufacturers who participated in the specification, produces D-Star repeaters and radios. What Hotspot software is available & what should I choose? Mount Diablo ARC June 17, 2016 "Digital Voice & D-STAR"
Dayton 2016 D-STAR Forum "Enhancing D-STAR - 3rd Party & DIY"
Mount Diablo ARC June 19, 2015 "D-STAR Update"
Dayton 2015 D-STAR Forum "New Ways to DIY in D-STAR"
Pacificon 2014 "D-Star Compatible Do It Yourself and Homebrew"
Dayton 2014 Drury Inn D-Star Night "D-STAR Compatible Homebrew"
Pacificon 2013 Oct 12 "Homebrew D-STAR"
Dayton 2013 Drury Inn D-Star Night "Extending D-Star"